I'm gonna keep this one fairly short because it's been going around the gaming press news lately and a lot of you probably already know about it. But as always when I report news, I'll cover briefly what's going on, then give you my take on it. The Elder Scrolls is currently in the midst of what I would regard as its third major issue since its launch a month or so ago: it has a very serious and growing bot problem. Now all MMOs have bots. And I should preface my discussion of ESO bots by saying that I've never played a single minute of World of Warcraft, nor have I even been in a room with a computer where it was running. But it's obvious now even to me that the tools that make botting in WoW possible have been modified for ESO. 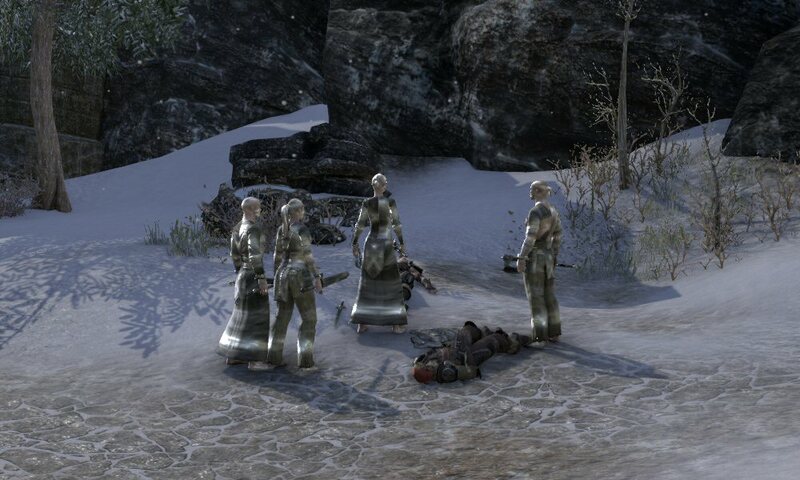 Botting has gone from a gold-farming business to being available to casual ESO players. You can't go ten minutes in the game without seeing a little cluster of between four and eight clients "following the leader" through dungeons and open areas. They rapidly sweep through normally-difficult areas wiping out everything that spawns in seconds. Then clusters of them gather around dungeon bosses and crush them repeatedly, usually destroying the boss before actual players can even get in more than a swing or two. I mentioned a few weeks ago that the corpses of some dungeon bosses were in little piles five or six high. Last weekend, I encountered one particular boss with a very high spawn rate whose corpses quite literally covered the floor of the entire room he spawned in eight or more deep. Meanwhile the fifteen or so bots killing him weren't even waiting for him to spawn: they were just repeatedly launching attacks on his spawn point until he appeared. So yeah, I'd say there's a pretty major problem. The prevalence of randomly-named bot characters, though, has changed to the use of more casual botting software which apparently allows a single player to carry along three or four more or less identically dressed and equipped "retainer bot" alts who provide mass DPS while the main handles trickier situations, healing, and crowd control. I'm sure some players are only doing this so they can compete. But that certainly doesn't make it right! And it's creating an escalating problem. GMs occasionally get into the game's version of local and inform players of their intent to kill the infestation and there's been a couple of times now when I've been in a dungeon trying to get at a boss to find a cluster of "players" disappear from the area in quick succession. So the devs are trying to do what they can. But it's clear that they're going to have an issue for a while until some kind of automated tools can take over for what is pretty obviously an overworked and over-extended team of GMs who instead of dealing with player issues are dealing with hundreds or thousands of bots. >Lately the developer has been sending game masters directly into the dungeons, where they either ask players to whisper the names of bots for an instant bans or command players to step away from the boss unless they want to be banned. What happens when someone mistypes a name and hits a non-botting player ? What happens when someone whispers the name of a player they don't like ? What happens when the bots start whispering names ? What happens when someone doesn't step away from the boss because they don't understand English, or aren't paying attention to chat ? I did a quick search and it looks like your correct about the WoW connection. Does ESO let you make macros using LUA? I did a quick search and found some ESO bots/marcos/hacks at some of the usual places. I saw one where the code was directly adapted from a WoW bot. And no, I'm not telling where I found the bots, macros and hacks. I usually only do that when the developer either has shown it has fixed the hacks or if using the hack or bot will lead to a good probability of getting banned. Your terminology is a bit off. In general in regards to MMO's, a bot can only perform pre-programmed actions.A good example is the spam bots in Jita. What you have been encountering is a program that clones what 1 client does, and copies it for the others. That's why there's usually that you see 1 guy run and if he jumps, a second later the clones will also jump. ISboxer, is a popular one on EVE for incursions, and/or ganking with is an example. Yes, a user of this clone program has an advantage over players who do not. But a bot doesn't even need the player, and many also have auto-login features. So you can setup a computer to boot up, and automatically start a) connect to the net, b) load the game and the bot, c) the bot automatically goes to work while you, the player, go to work or school, get laid, whatever. Meanwhile the bot is playing for you. Subtle, yet meaningful naming differences there. Bot = self play, ISboxer (or other clone program) = control multiple at once, but still usually requires a player. Bot's are also usually pretty easy to pick out, because they react to events exactly the same way, every single time. No, these are bots. They are acting independently but all following the same script. You can verify this quite simply by observation: run to this spawn point, if there's an NPC there kill it and loot the corpse. Then run to the next spawn point. Repeat ad infinitum. If an NPC spawns while a group is arriving, some of the bots will path to the next spawn point, some will kill the NPC. You can interrupt this behaviour by drawing NPCs away, leaving unlooted corpses on the ground, and a number of other tricks. You'll get a little circus of bots running around in circles mimicking each others behaviour. They are not synchronised, they are simply following the same script. Easy ways of dealing with the bots are to draw aggro from any NPC that has an AoE attack, such as sword/board NPCs who charge, pyromancers who leave AoE spells around, night blades who have a blade-spin attack, and so forth. It's amusing for a little while: draw NPC, NPC uses AoE which the bot can't handle, bot dies and logs out. New bot logs in, wash, rinse, repeat. The bots are also programmed to attack anything in range. They aren't discerning. So you can kill them by drawing more NPCs into their forward arc. The bots attack the NPCs, get overwhelmed, die, log out. New bot logs in, wash, rinse, repeat. Then there are the auto-attack "bots". They just path to a particular spot, point a particular direction, then spam attacks. The ones I've seen have been using staves. Just sit there spamming the staff's heavy attack in the hope that it hits the boss when it spawns. These are bots, not multi boxers. Jester isn't confused. You make good points, however some of what Jester was describing: follow the leader, bulk dps with original providing core healing and trick elements... those are quite common to multiboxers. The auto attack bots, and scripted travel&kill bots, most definitely bots, and oh so fun to mess with like you described. I'm still highly against multiboxers, and believe they should be classed as bots, and treated as such. If you can't handle running X number of accounts by hand, alt-tabbing between the clients, you shouldn't be running that many accounts is my stance. I'm in the same boat, to my mind anything beyond one button press leading to one action in game is automation. I was just clarifying that these bots are all independent actors that happen to follow the same script. The ones out in the world are pathing around the same path because the one bot is being sold to many clients. I don't profess to know much about it, but Blizzard has something called Warden that supposedly makes botting fairly difficult to pull off in that game. Actually Warden doesn't do a very good job at all. WoW has been infested with bots for years. Sure, Blizzard bans a few thousand of the most obvious bots every 6 months or so, but within a few weeks they're all back (some on new accounts, some on the same account). Blizzard also had to scale back Warden due to concerns amongst players. But even in its heyday, programs like ISXWarden (written by the same guy who wrote ISBoxer) were able to counter Warden most of the time. And that right there is the problem with ISBoxer - written by a bot programmer, is obvious botting yet CCP allow this. Pathetic, as are all its fanboys ready to defend it on forums, scared that anyone will take their Isk printing machine away. It is not how the game is advertised, or supposed to be played but a few more subs now mean more to CCP and a good game. Botting is one of the reasons I'm a bit leery of Eve:Legion being free2play. Want to deal with botting? Add pvp in all areas of the game and let players handle it, keep bots around, but severely punish those who use their services. Going after bots themselves never worked and never will. The day after they do that, there will be people cutting down every new, burlap-wearing character that stops in the middle of a square, wielding the excuse that "I thought they were a bot lol." The plague of bots reflect a number of design decisions that Zenimax/Bethesda made without considering the impact of botting. The degree of interface customization is one. Having bosses and certain resources spawn regularly at exactly the same point is another. They're going to have to spend some time refining and altering their design to discourage bots in the first place. The purely reactive stance they're taking now is just an endless game of whack-a-mole. Reminds me of good ol' times of Ragnarok Online. Of course RO didn't have fixed spawns for mobs(even bosses) so that required bots to actually behave a lot like normal players. I am staying away from dungeons because they look as silly as it gets, even without bots (seriously... why no phasing? ), and I am even pondering whether to move to the American server to avoid euro prime time. I like it when there are just a few people around. For the most part I can run around and do my thing, but if there's a place I want to get into that I can't (I tend to run around in areas above my level) then I only have to wait for a bit before a handful of people show up and I can run with them long enough to get where I want to go without having too much contesting for my precious, precious resources. That's about perfect for running solo. I agree absolutely with your opinion of the really crowded areas. Oh, and I'm really glad I'm not the only person who's found that every damn house in the main starter towns on the EU servers is perpetually plundered. You have to get out and go to less-traveled areas to find your crafting materials and your recipes. You do not see this exact sort of thing as obviously in WoW... mostly because dungeons and bosses are instanced and because good drops tend to be bind on pick up... but any game with shared dungeon content and drops that can be re-sold on the market will attract bots like flies. There is good money to be made selling in-game currency for real-world money at the launch of any title, which drives this even more so. And it is an almost self-sustaining market for a while. There is some initial grinding to build up enough currency to start selling. The people who buy your currency then use it to buy good gear from the market, which you have been farming and listing, so the in-game currency comes right back to you, only to be resold to the next guy, who buys some more of your gear, and so on. As long as there is a viable market for the in-game currency, this will persist. Once inflation has killed the economy, or at least forced the devs to move to some sort of token economy where you cannot trade the currency (honor points and such) those sorts of bots tend to go away and get replaced with bots focused on the individual player and their resource/honor/whatever farming needs. The bot maker makes money selling his well tested bot to players now. WoW bots tend to be that at this point. Google will point you at various options that will harvest or fish or run battlegrounds or heal LFR for you. I saw this sort of thing happen in EverQuest and EverQuest II up close and personal, and it still goes on in EVE and other games. That it has swamped TESO isn't a surprise. That the devs didn't seem to think history would repeat itself though... that seems like a rookie mistake. So multiboxing is bad for ESO, but good for EVE? I'll never understand why CCP hasn't cracked down on the likes of ISBoxer, when they have been so outspoken against botting in general. If their stance is truly that a live person must be issuing the commands, then it stands to reason that if you have 20 clients running, you should have to enter the command 20 times. Otherwise, the live person is only commanding one client, and the bot program (yes, ISBoxer is a bot program) is issuing 19 copies of that command. You are describing multiboxers, not botters. You should probably be more clear about the botting behavior you are seeing.